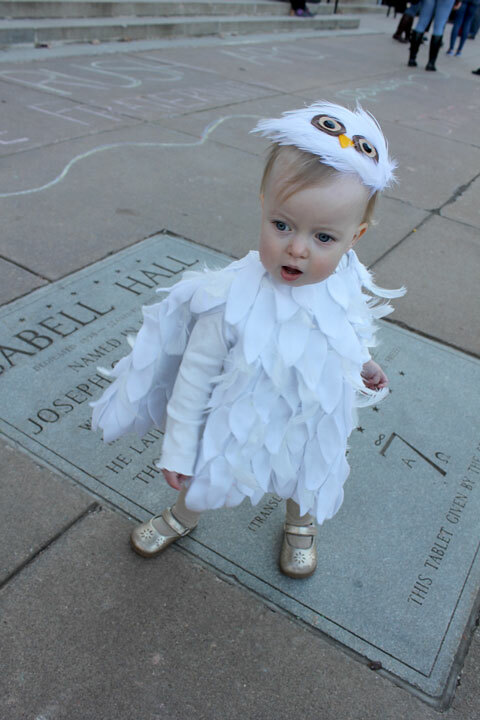 Lottie dressed as little Hedwig to go with her big sister, Hermione. 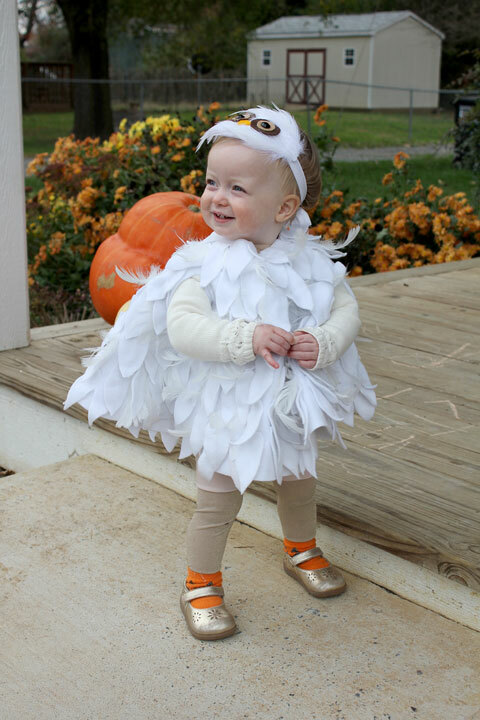 After looking at many, many baby owl and Hedwig costumes on Pinterest, I found this one and knew it was the one. Her tutorial is here. The main fabric is some cheap white polar fleece that was left over from the Max costume I made Leo a few years ago. 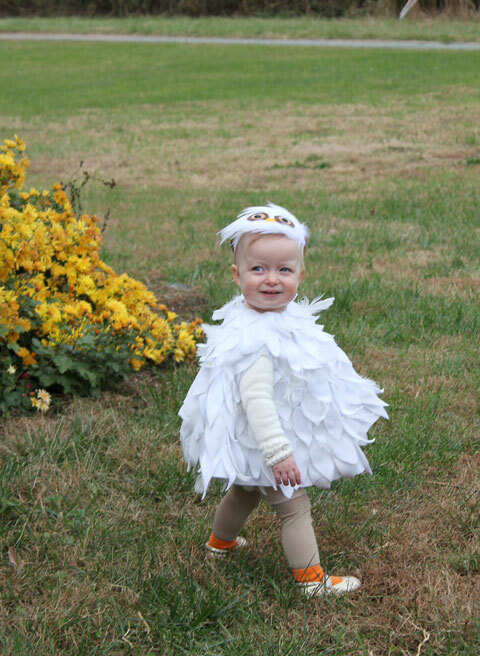 Other supplies were a white feather hackle pad from an etsy seller, a package of white feathers that I barely made a dent in, a package of white 5/8" fold over elastic (from Jo-ann) and felt scraps for the headband. The black part of the eyes are some sticky gems I found in the Halloween supplies at Michael's. 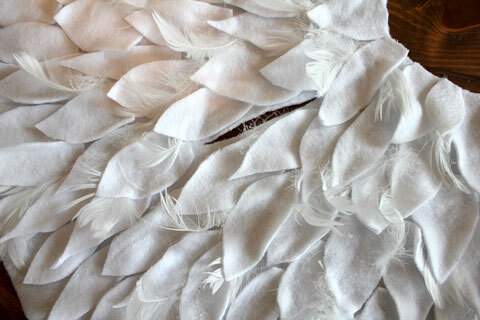 I cut out the feathers four-layers at a time in front of the TV one evening and it didn't take long at all. 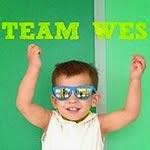 They are free-handed in a variety of widths and lengths. 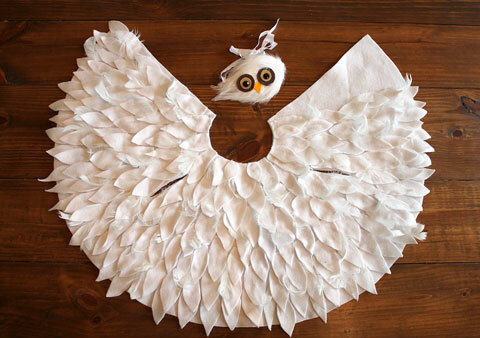 For the cape, I didn't quite follow her tutorial. Instead, I measured the neck line of one of her dresses that fits well, and cut a circle skirt using that measurement. 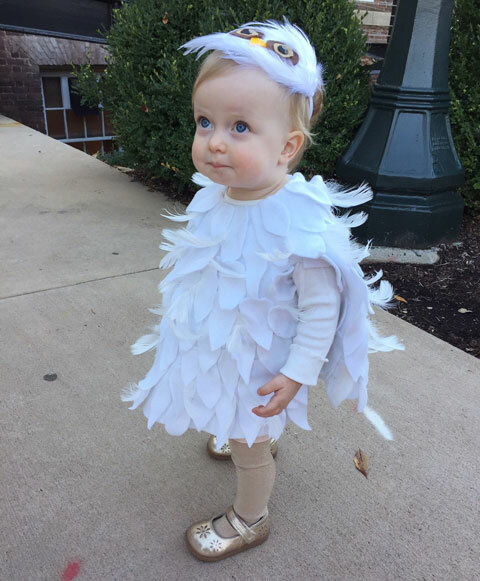 I cut a slit all the way up it to open it, wrapped it around her, and then marked a section of excess to cut out (and used that for more feathers). I think you could get away with 3/4 of a circle (or even less) but I left hers a little fuller. I draped it over her again and marked where her arms would come out with a marker. Then I stabilized the fleece there (on the under side) with a strip of fusible interfacing and cut a slit. The rest was all hot glue! I started at the neck and worked my way around and down, tucking each new layer a little under the row above it. Then I went back in and added the real feathers randomly. I left a small section uncovered where the back overlapped. 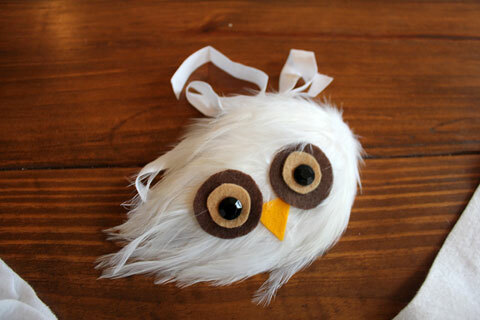 The hackle pad is hot glued to the elastic and I simply tied the ends in a bow around the back of her head. I used a cone of thread to measure the big brown circles, and a smaller spool of thread to measure the light brown circles. I was going to add button closures, but realized two safety pins would work just as well. 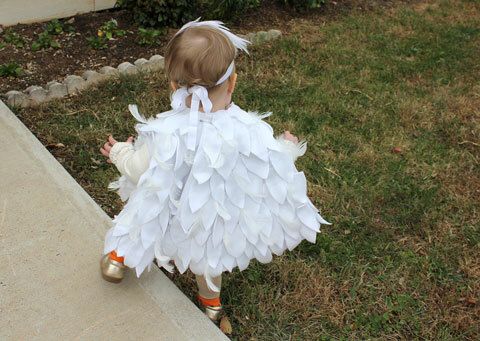 She has on a white long sleeved onesie (and a white sweater when it was a little chillier) and some gold tights and shoes. 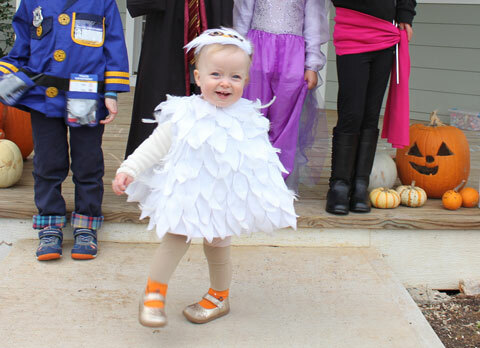 She got a million compliments and had a blast trick-or-treating. 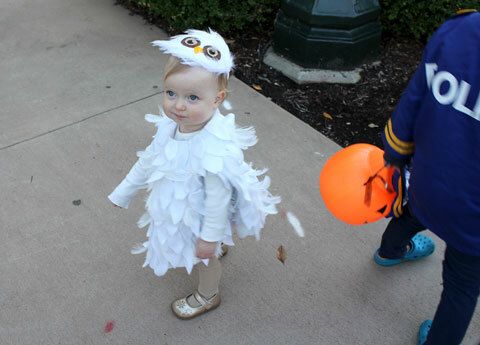 No candy necessary—she was just happy to be out walking. 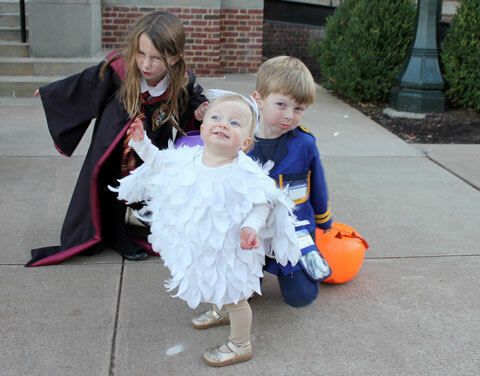 We couldn't convince their brother to be Harry, so he was a muggle (police officer). 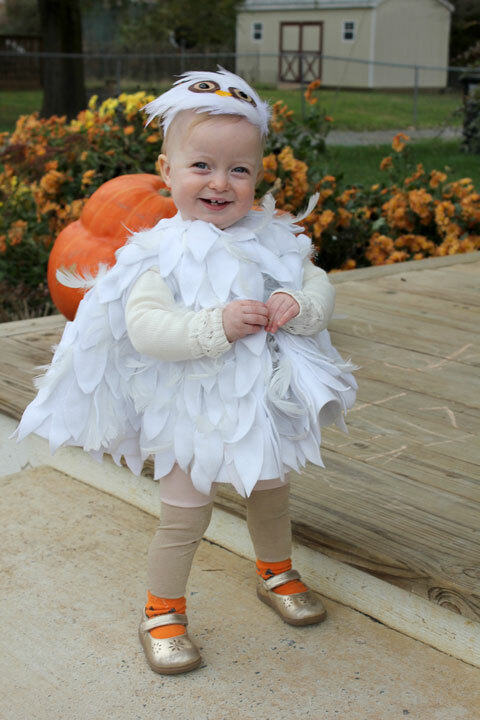 Only a handful of people thought she was a chicken. 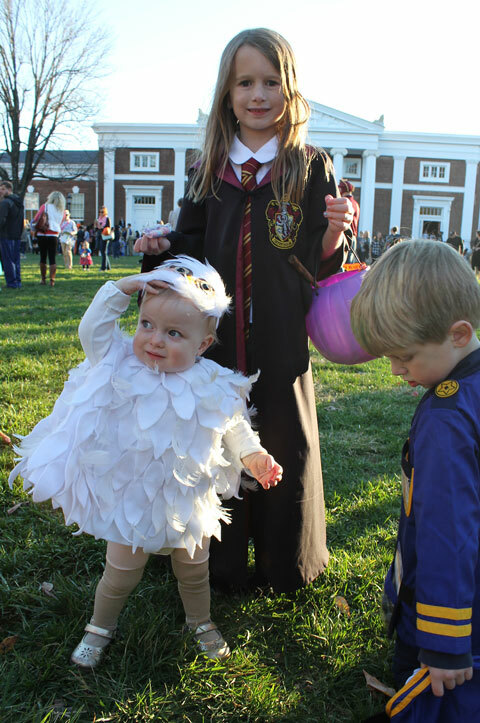 The cutest chicken they had ever seen, of course.